The CS111C.FT6003 TAG Heuer Microtimer Men’s Watch has a highly unusual styling. It has an exceptionally accurate electronic movement, and is precise to 1/1000th of a second. Its square dial and digital readout give a futuristic appearance. The CS111C.FT6003 TAG Heuer Microtimer Men’s Watch is as revolutionary in design as it is in function. This men’s timepiece is equipped with the first Swiss electronic movement. It has precision accuracy like no other. The technology infused in the Formula 1 was the blueprint for the CS111C.FT6003 TAG Heuer Microtimer Men’s Watch. Although this is a traditional chronograph, it has other vital functions, such as best lap calculation and lap time memory. This chronograph has a stand by mode, which allows the display to be switched off. The styling of this watch is contemporary, the modern day looks match the innovative architecture of its interior. The CS111C.FT6003 TAG Heuer Microtimer Men’s Watch has a stainless-steel case, and a black dial. 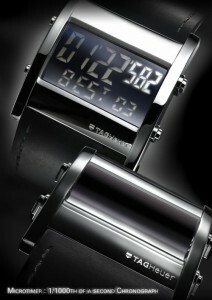 It is a Swiss Quartz Digital movement, with a sapphire crystal. It is a Chronograph and has alarm, date, dual time, and lap time functions. The case measures 37.3mm in diameter and 13.5mm in thickness. The bezel is stainless-steel. This watch is water resistant to 100 feet. The CS111C.FT6003 TAG Heuer Microtimer Men’s Watch retails for $1995.00, and is available through authorized dealers.